The original Capsule Day was Monday, August 23, 1999. 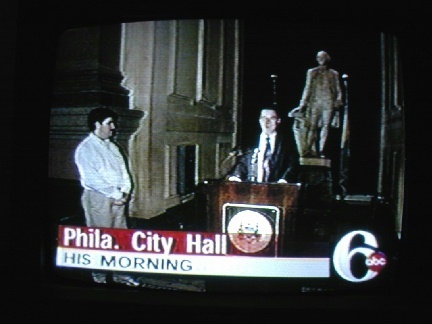 On that day, after a City Hall proclamation ceremony performed by the mayor's office, dozens of capsulers spread throughout Philadelphia (as well as in selected points around the country) to complete projects to document life on an average day in the 20th century. Videotape, audiotape, still photos and artworks were the main media involved. Some focused on landmarks, institutions of historical import or interest, others on people, and others simply on obtaining the greatest possible quantity of footage. This site, CapsuleDay.com, will collect and house selections from those entries, which as time goes by become richer in meaning and historical perspective. This year, 2003, Capsule Day will be observed with two events: A documentation day on Thursday, August 21, which will bookend the 20th century day with updated footage from the same locations as well as supplemental footage from even more participants, and a party on Saturday, August 23, where capsulers will view, discuss and celebrate this year's contributions. As to the documentation day, many of the original 1999 capsulers are retracing their steps at least partly, generating new 2003 footage of what was seen back then - in many cases there's already a marked difference. Some are doing new projects. The 2003 project will be anchored by a City Hall-centered thread network which will be created almost entirely by new capsulers and exponentially increase the virtual-reality navigability of the overall project. If you're interested in being one of those contributors, let us know. "This site is under construction" has been so overused that it's now virtually meaningless. However, in the case of Capsule Day, it must be called back to service. That's because this site will, over a period of years, be constantly evolving to approach the interactive experience inherent in Capsule Day's design. It will start, though, with photo images and just a smattering of video. Far more people submitted still photos than video footage for Capsule Day. Of the photo projects, the Capsule Day site so far includes only those of Tyra Petrak and Joel Spivak, each of whom took many multiple photos of the same location to give a sense of the place over time. And Eliot Duhan took sequential photos of the Schuylkill River from a canoe. (Ironically, these photo projects are represented provisionally by animated GIFs, while video projects are represented by still photos.) After the completion of the backbone of connections between projects such as these, more photos, artworks and artifacts will be added to the site. In the meantime, viewers interested in a sampling of the many video submissions from 1999 can check out the QuickTime Capsule Day Video Sampler. Special thanks to David Peterson for taking the digital photos used as signal images for each video.